Despite repeated claims by the Bunyan Marsous Operations Room spearheading the fight against the so-called Islamic state (IS) in Sirte that the militants’ last bastion in the town is about to fall, the fight to destroy them once and for all continues to rage and be bloody. According to Misrata Central Hospital, one BM soldier from Kikla was killed in clashes today and 16, all but one from Misrata, wounded. Yesterday, three soldiers were reported killed and eight wounded. 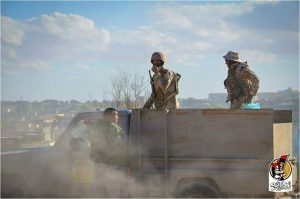 With more than 650 of its troops now killed since the battle for Sirte began, the operations room has largely ceased publishing casualty reports. However, a spokesman was quoted today saying that in fact two of its soldiers died, although he put the number of injured at ten. He also said that the BM forces were advancing on more than one front against IS in the Giza district and that yet a new massive military operation to finally destroy it was about to be launched. Earlier in the day, an operations room official also claimed that IS had set fire to a number of houses in the town’s Giza district, said to be its last holdout, and were holding a number of families as human shields. Part of the BM’s problem is the warren of underground tunnels which permit BM snipers to move from one location to another with deadly effect.